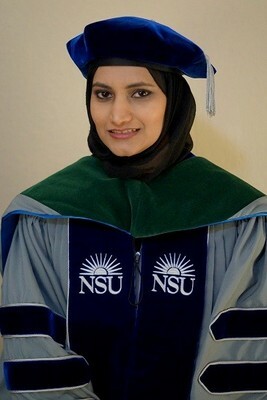 I believe my journey to become a physician started from my first day at nsu as an undergraduate. Biology major here at NSU is not only great but full of opportunities. It prepared me well for medical school. Courses especially like biochemistry, microbiology, anatomy and physiology, histology were taught well and prepared me for the next level. I met great people who became my lifelong friends, inspiring mentors such as Dr. Emily Schmitt for giving me the opportunity to do research, Ms. Gail Levine, my supervisor at the academic services for pushing me to my limits and Maria Farrell; another inspiring student who inspired me to do research. From fun activities to complex courses, to scholarships, to take honors courses, to research symposium and to chances to attend conventions all over the country, it was all possible to do in short span of four years and how can I forget my wonderful dean Don Rosenblum for approving for these opportunities for his students.